The 8th century CE was a period of Hindu resurgence in Kerala. Adi Sankara, who wrote about Advaita with literary force and philosophic depth lived during this period. The Tamil poets—Saiva nayanars and Vaishnava azhvars—created large volumes of influential devotional literature and triggered a popular mass movement. Economically these were prosperous times due to extensive external trade. Devotion coupled with wealth resulted in a spurt of temple construction; rulers and lay people considered the construction and protection of temples as an essential social responsibility and donated generously. Though the original shrine may have been built in the 6th century, it is during this period that we hear about Sri Padmanabhaswamy temple for the first time in Thiruvaimozhi of Nammazhvar. In ten verses Nammazhwar describes Thiruvananthapuram, one of the 108 sacred sites for Vaishnavites, as one which has “lots of trees, lots of fragrant flowers, and most beautiful gardens” and called it Ananthapura implying it was enclosed by walls. He also describes the idol of Vishnu as reclining on the venomous Adisesha, exactly the same way see him today. Over the next millennia, Sri Padmanabhaswamy would see prosperity, war, and invasions—both domestic and foreign. Initially he was part of a small kingdom, but that small kingdom, under the leadership of a visionary king would grow to become one of the three major kingdoms of Kerala, encompassing not just South Kerala, but parts of Tamil Nadu as well. Eventually the kingdom would belong to him. He would also accumulate staggering amounts of wealth over centuries; a humbled Dutch captain and a powerful British Resident would among the many who would go before him with their offerings. The story of how this wealth came to be and how it was safely guarded by the priests and the royal family for all these years is inseparable from the history of Kerala. In Cleopatra, a life, Stacy Schiff recounts how Egyptian temples stood at the center of religious and commercial life with the temple priest also moonlighting as a reed merchant. Such a system did not exist in Kerala. Its temples were never known for odious extravagance or opulence. Many other ancient kingdoms accumulated wealth by invading and plundering their neighbours, but according to historians, Sri Padmanabhaswamy’s cellars do not contain war booty. Then how did the temple accumulate so much wealth? After the mention of the temple in the 8th-9th century by Nammazhwar, there is not much information for another three centuries. Around the 12th century, Venad, a small Kollam-based kingdom became an independent entity and Sri Kotha Keralavarma (1125 – 1155 CE) started the reconstruction of the temple which would go on for another six centuries. During this period, we hear about donations to the temple for the first time: silver by a nobleman in 1183 CE and ten golden lamps by Parantaka Pandya. Veera Keralavarma, ruler of Venad (1344 – 1350 CE), donated vast amounts of land and about 3000 pieces of gold to the temple in response to him being responsible for the death of a few Brahmins. The current wealth has been retrieved from some of the six cellars around the sanctum sanctorum. These cellars existed around 550 years ago and there is mention of ornaments being retrieved from the cellars to decorate the painting of the king of Venad during that period. In 1686 CE, the temple was gutted by fire and there was no worship for three decades but the priceless valuables remained safe in the cellar. Just two years before the fire, Umayamma Rani, who would later flee due to an attack by a Mughal invader, donated various ornaments and silk to the temple. It is mentioned that such donations were moved to the cellar for safe keeping. When various kings ascended the throne, they too donated gold and other precious stones to Sri Padmanabhaswamy. In the 17th century, the pettiness of the kings of small territories came quite handy to the Dutch who devoured Kochi, Kollam and various other kingdoms. Interfering in the internal affairs and exploiting the difference of opinion among the kings was the Dutch policy and by this they could eventually control the whole of Kerala and the lucrative spice trade. During this period, Travancore was whipsawed by a poor economy and constant conflict between temple administrators and noblemen. This was a feud which had started at least a century earlier. 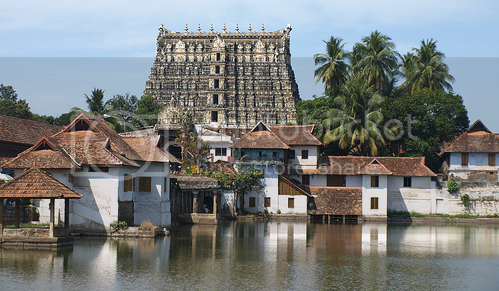 Rules for managing the temples of Kerala were set as early as the 9th century when various noblemen met in Paravur. In 12th century, the committee which managed Sri Padmanabhaswamy temple used to frequently get together to make decisions, but the relationship between the king and the temple administrators was not always cordial. In the 17th century, during the time of Adityavarma (1672 – 1677 CE), a group of eight noblemen under the direct supervision of the king was responsible for the temple management. The temple administrators divided the temple property into eight and gave them to Nair chieftains for revenue collection. Soon a feud started with with the king’s men on one side and the rest of the administrators on the other side leading to a brief closure of the temple. All this leads to the resolute and brilliant Marthandavarma, the founder of the kingdom of Travancore as well the person responsible for the the current state of the Sri Padmanabhaswamy temple. During this period of strife, Marthandavarma annexed the smaller kingdoms around Venad to create Travancore. He defeated the Dutch in the Battle of Kolachel in 1741, sixteen years before the Battle of Plassey. For India of that period, this was a distinction of some weight. The Dutch agreed to support the king in his fight against other European powers and the commander of the Dutch forces, Eustachius De Lannoy, became the commander-in-chief of the Travancore armed forces. De Lannoy too made donations to the temple and it is possible that the Dutch coins and the Belgium cut-glasses came from him. Marthandavarma also embarked on a construction spree at the temple. The repairs and the construction of the buildings around it started in 1731 and was completed two years later. The current temple structure and the sanctum sanctorum were built during his period. Some of the underground cellars were strengthened with the aim of keeping the temple wealth safe from fire. In 1733, the idol of Sri Padmanabhaswamy was reconstructed using saligram silas (Ammonite fossils) bought from Gandaki River in Nepal. The construction of the temple tower which had started in 1566 CE, reached five stories high during this period and would be completed during the time of his successor. He also made arrangements for the main festival to be conducted twice a year. This visionary king in a unique historical and spiritual move surrendered all his riches and the kingdom he built to the family deity on January 3, 1750 CE; he and his successors would rule the kingdom with the official designation of Padmanabhadasa or devotee of the deity. That arrangement continues till today. Donations would continue to flow even during the British reign with the Resident offering generously to the temple. In 1932, when Chitra Thirunal ascended the throne, one of his first acts was to open these cellars and estimate the wealth; it was calculated to be around one crore rupees. If the temple had so much wealth, how did it survive looting by the insiders and the invaders? Appropriation of temple wealth was considered as one of the five great sins prescribed by the Dharmasastras and it may have prevented the looting of the temple by the administrators. Though Mahmud of Ghazni, the Mughals and Tipu Sultan did not reach South Kerala, various Islamic invaders did attack Venad. In the 14th century, there is mention of Muslim invasion into the region and how it was spoiled by Iravi Ravivarma. Another successor, Adityavarma, who was responsible for constructing the Krishna temple and protective shelters for cows in 1374 CE too repelled such attacks. In 1690, a person referred to as “Mughal Sardar” attacked the southern border of Venad causing the regent Umayamma Rani to flee. Kottayam Kerala Varma who had come on pilgrimage from Malabar defeated this adventurer. Since it does not contain war booty, did all the wealth, found in the underground cellars come via offerings by various devotees, kings, queens, and traders? Besides the temple inscriptions and royal decrees, the most detailed records of the assets come from what is known as the ‘Mathilakam records’ which are about 100,000 palm leaves stored in thousands of bundles, in the Kerala Archives. Some of these records were published, but a vast majority of them remain unwrapped; an effort was launched in 2009 to publish the rest, but the plan was abandoned in 2011 as the government does not employ anyone who can read the ancient script. This is disappointing, since the royals kept meticulous records and if we could read them we would know the source of the Roman and Napoleonic era gold coins, Venetian ducats and drachmas as well as the solid gold idols of Sri Krishna and Vishnu. It could also help solve another mystery: In 1766, the Zamorin’s entourage fled from Malabar to Travancore, presumably after emptying the Calicut treasury, to escape the pillage of Haider Ali. The Zamorin took his own life than surrender. It is possible that some of that wealth reached Travancore treasury. If the records don’t mention this, an inventory of the items would reveal if there is any truth to this. The discovery of the the wealth has caused various experts to advance theories on its origins including some indulging in imagination. Usually absence of facts causes myth to be created, but in this case speculation and hoary propaganda is unwarranted since the source of the wealth is well documented. If the government cannot find a specialist to translate the royal records, it should have them carefully digitised and published online, so that the job can be crowdsourced. A Sreedhara Menon, ;A survey of Kerala history(Sahitya Pravarthaka Co-operative Society [Sales Dept. ]; National Book Stall, 1967). Quick one: the Kerala Archives link points back to this blog. Updated with the correct link. Thank you sir.